Congratulations to Harrison Radcliffe from Unify Business Solutions for being named March's Apprentice of the Month! He will be receiving £50 in high street vouchers. "Harrison joined us here at Unify five months ago and he has quickly become a valued member of our team. He has not only gained knowledge and expertise through his apprenticeship, but he has also grown in confidence and been able to lead internal team discussions. Harrison has continuously assisted our customers to resolve their technical problems, thus helping to drive down our incoming support calls.Harrison has a thirst for knowledge and applies himself completely to his role. His problem-solving skills have enabled him to visit sites with our engineering team to help rectify issues and provide support when required. This week, he supported Unify as we took part in the World of Work Week – Employer Fair, held at Meadowhead School. We participated in the event to help encourage the next generation of young people into the STEM apprenticeship opportunities that we have available here at Unify.Harrison spoke with great enthusiasm and worked hard to encourage the children to look into apprenticeships as their future career choice, getting involved in activities and offering advice. Thank you Harrison, you’re a star and are a great role model in showcasing the benefits of having an apprenticeship working within a business." I would like to nominate Luisa Chapman for apprentice of the month for a number of different reasons. Since I first met Luisa her attitude has been exemplary. She started out with a quiet confidence and a clear desire to learn. She has become a key part of our team and her growing insight into digital marketing has become a real asset to IDDE. With regards to learning and in particular her apprenticeship training, she has strived to complete work as soon as she gets her next project brief. Also, she wants to complete the work to the best of her ability and very comprehensively in order to get back to helping our team. Assuming her work with Baltic is at the same standard as IDDE’s, which I have no doubt that it is, the standard she sets is excellent. This month in particular Luisa has performed at a particular high standard as IDDE’s social media engagement is increasing no end. In addition, she has been extremely helpful for me in planning a key event which involves new techniques that we have taught Luisa and an article that she has written about customer journey mapping. Luisa deserves to be awarded with apprentice of the month (and the year if she continues in this manner!) as her attitude towards learning is outstanding, her ability in the workplace is improving and her delivery of projects is more often than not, very accurate. As some of you may know I look after Aaron Burt at Pulsar. He has been awarded the Apprentice of the Week which he couldn’t be more happy about. I would like to nominate Aaron for the Apprentice of the YEAR let alone apprentice of the month. He works so hard, so enthusiastic and works at full capacity all the time. He is now competing with established account managers at Pulsar who have been here for a number of years. But leaving hard work aside for a moment, it’s the morality and enlightenment that Aaron brings to the office. He is bright, clever, and wants to make a difference with whatever he does. The improvements, which of course are most important – I can see them as clear as a 24 karat diamond. Absolutely astonishing efforts all around. Since working with Baltic he is more organised, optimistic and conscientious. Furthermore his IT technical knowledge has come on leaps and bounds since starting the apprentice. With help from his tutors at Baltic he is almost sure that a Distinction is the lowest grade he would receive. Yes of course, at times he gets carried away and thinks more about his targets at Pulsar, however when reminded, he will dedicate days just to make sure that he is on top of everything. I would also like to take this opportunity to thank those at Baltic for helping me with Aaron. Marc has been an absolute star and nothing could be done without him! The one and only Dan Petrusow could not had said it better himself – Aaron is an absolute pleasure to work with, dedicated and proactive. I would like to nominate Jade for apprentice of the month. She is an outstanding apprentice. Jade has attended just one work-shop with Baltic but already she has put her knowledge to good use, pulling images from website through reading html code. She becomes a more valuable member of our team each day. Jade always gets on with any task thrown at her. Jade shows a real willingness to learn, always asking questions and partaking in team meetings. We recently set Jade the task of presenting marketing trends in the industry. Jade did not shy away from this challenge, instead she grabbed it with both hands and got on with putting together her presentation. A particularly great effort considering Jade has not given presentations before. Jade is great at teaching and helping other members of the team when they are struggling. Jade is very patient and thorough when passing her knowledge onto others. If they need help Jade is there to support them. There have been a few occasions where Jade has gone beyond her duty to help the team. For example, there have been a few instances where we have had to ask Jade to assist on her days off. Jade did not complain once, instead she jumped to assist the team. I would be lying if I said that most people would do the same. Jade had only been with the Media team for 6 months and still has a great deal to learn but we would not be where we are without her. It is difficult to put into words the impact that Jack Makin has had on our business. Jack shows an excellent attitude to work which is a real credit to him and Baltic. Jack is dedicated to working on his personal development and takes every opportunity for growth with both hands and gives it everything. Jack is a focussed individual who wants to have a successful career and with the training that he is being provided by Baltic, he is well on his way. I have been especially impressed with the effortless fashion Jack has integrated into our team. He consistently supports his fellow workers and our clients without the need for prompting and we have received several positive comments from our clients regarding his efforts when they have logged support issues with him. Whilst many consider apprentices to be junior members of their team, Jack is performing as well as more senior personnel. The greatest compliment I can give him is that he is able to perform tasks well above his position with aplomb. Jack has a no-fuss attitude to work and I enjoy working with him and am pleased that his immediate future is secured with us and he will be taking on his next apprenticeship as soon as he completes this one. This nomination is made on behalf of the whole team at Unified World Communications and not just myself. We would be delighted to nominate Luke for the apprentice of the month award. Luke recently joined the IT/Customer support team and has seamlessly settled in to the business. He is very popular with both the staff and customers, having already received several commendations for his politeness and endeavor from customers for ensuring tasks are completed to a high standard, with professionalism and precision. Luke has been quick to pick up the professional side of working in a business environment despite having no previous office experience. He quickly understood what it was to work in a B2B environment and dealt admirably with the pressures that brings. We feel Luke has added another dimension to the team, he is always first to put himself forward to undertake new tasks. His quick grasp of what the apprenticeship entails, and the amount of time and effort needed to accomplish his goals is also be applauded. We all hope Luke keeps up this great start and we look forward to working with him to help him excel within his apprenticeship. I would like to nominate Connon Burbage who is currently working with Computacenter on the First Line desk on First Group and XPO contracts. I was privileged to have been part of the initial interview/selection stages back in September 2018 following Connon through the Apprenticeship journey working on the above contracts as his Team Leader. From the interviewing stage Connon has taken the lead working as part of a team and team work is his top priority and to encourage others. Connon has given full commitment and drive to the apprenticeship programme. He ensures he is always prompt for his allocated shifts and for the past three months has no scheduled adherence failures. He has no sickness record. He is a well-respected member of the team and will always without any question assist others as and when help is required. Connon volunteers to do extra hours without any question and will always be the first to cover for sickness absence. Connon has been assisting me with End to End Incident management on the accounts, driving down aged tickets and distributing amongst the team to encourage others to make this a joint effort. The results have been recognised by Computacenter Service Management. I have no doubt that Connon will continue and complete the programme with excellent examination results. In such a short space of time, Jacob has become a very integral part of our social team here at Ponderosa Agency. Taking on more and more responsibility each day he is a great support to the wider team and our clients have now reached the stage where they request his attendance at face to face meetings and brainstorms. Confident in leading on ideation and taking this to execution stage, Jacob has seriously impressed the agency and our clients. Jacob regularly presents to some of our biggest clients, on new and proactive strategies and is often the driver behind the proactive thinking for our clients, creating the proposals to support his thinking. Jacob is also key to driving forward our own agency footprint on social media, generating a space for us to live on the platforms and cutting us apart from those we rub shoulders with. His inquisitive nature is one that impresses on all levels and how Jacob applies his theory and findings by bringing this to life through ideas and strategy. Making a true difference to our clients, in his unique style, he has made the role is own and certainly deserves wider recognition on his credible apprentice work to date. I would like to nominate Elle Chippendale for Apprentice of the Month. Elle has been working for Creativehill for the last 18 months and transferred to Baltic from a previous, now non-existent provider. During her time on the Baltic course she has excelled her social media understanding and is now implementing successful strategies for our customers. She has a fantastic grasp of our services and processes, and as a result of this and our confidence in her ability, she has taken on larger accounts within the organisation and she is responsible for over £5k pounds worth of social ad revenue per month for some large brands. As an individual, she is an asset to the team both incompetence and in personality and for the first time she seems to be enjoying learning. Niall joined the team here at ievo Ltd in August 2018 and fast became an active member of the team. Since day one he has continuously been focused on learning the full remit of his role as customer support adviser whilst committing time and energy with his studies at Baltic Training. Niall has demonstrated how much his skills and knowledge of ievo and his technical understanding of our products has grown recently by single handily running the technical support department while other support colleagues were overseas on client business. Niall proved his capabilities by successfully monitoring, assessing, resolving and reporting all support cases without issue or assistance. Further to Niall’s credit is the outstanding customer feedback we have received regarding his technical understanding, manner and attitude through our customer feedback survey. Alongside his responsibilities Niall has managed to maintain a positive attitude to his studies. 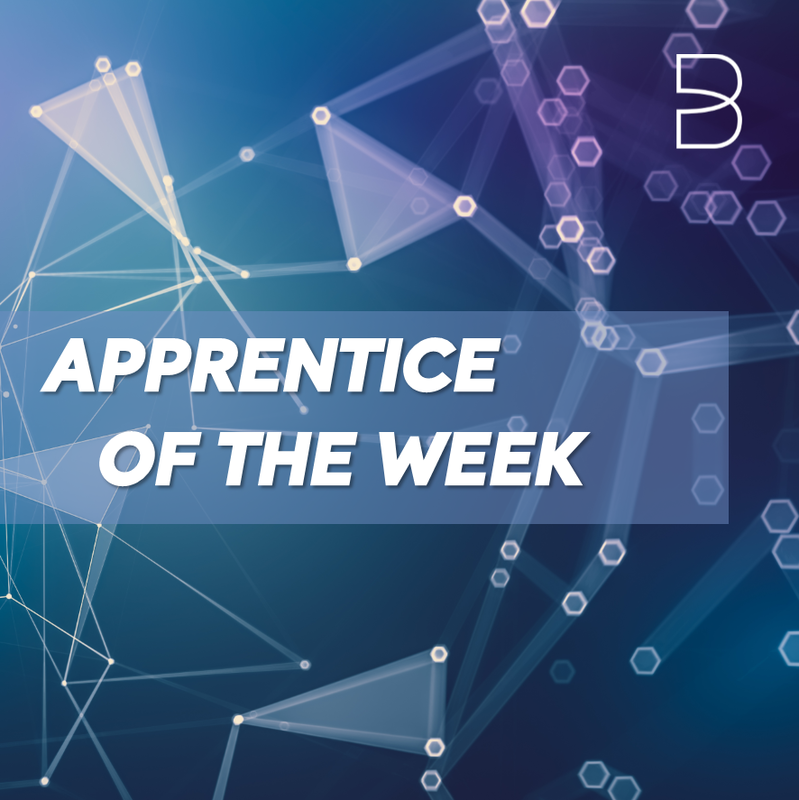 Managing his time to ensure he has completed all course work ahead of schedule and to the highest standard, he has also requested to start his next modules early after achieving a high pass on his recent exam and being awarded ‘Apprentice of the Week’ by Bob Davies. Niall has put in an incredible amount of work, exceeding all KPIs in alignment with his responsibilities at ievo, achieving great results in his studies and receiving numerous credits for his performance, dedication and technical prowess from customer and colleague alike. In a short period of time Niall has proven (and continues to prove) how much of a valuable addition he is to both the technical support team and the business as a whole and we are more than happy to continue to support his journey with us.